Perhaps one of the most charming sci-fi movies of the last few years is Jeremy Kipp Walker and John Mitchell's tale of alien takeover thwarted by music. Yes. Music. 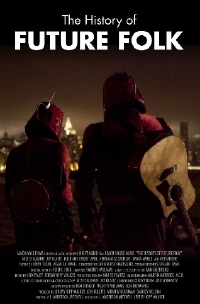 The History of Future Folk tracks the adventures of Bill and Kevin, two alien invaders from Hondor who discover the miracle of music and choose to partake in the act of making and sharing music rather than destroy our meagre planet. When the duo discover a second mission to finish the job they weren't able to do, they fight to save our planet. It's an interesting twist on the sci-fi tale, one which I enjoyed just as much as Zack did when he saw the movie last year at Rio Grind (review). It's not only a charming story of love but one that uses the invasion trope well and without ridiculously huge and unbelievable special effects. It's really about the people and the story and it has heart. Not to mention a catchy bunch of musical numbers. The History of Future Folk will see a limited theatrical release in late May and early June and will be available on VOD June 4th.